— The Ataris, "So Long, Astoria"
I was a dorky kid. I didn't really know it at the time....and by the time I figured it out, I really didn't care. I was quiet. I played the saxophone (faked it my first two years!). I didn't like playing video games, but I could memorize the Legend of Zelda map and loved doing stats while my friends played old school (not old at the time) baseball. I had some close friends, but not a ton of them. I flew under the radar for most of my days in school. When I got to high school, it was pretty much the same thing. Most people will say it's because my mom never gave me a chance to speak, because she did it so much (with gusts of up to 150 words per minute!) But, I knew a little better. I was just quiet. I played golf, I reffed basketball and I didn't go out of Saturday nights because I wanted to watch Saturday Night Live. That was my fun. When I got to college, my freshman year roommate (who is now one of my great friends), talked less than I did. I realized that one of us had to talk, so it began... And now I speak for a living. Go figure. From teaching for the past 13 years, I've run across a huge variety of kids. There are quiet kids and loud kids, athletes and non athletes, smart kids and happy kids and competitive kids. You name it, I've seen it. The cool thing about all these kids is that it's all okay. They are all kids who just want to be happy. So no matter what kid comes through my camps, I try to make them happy. It's kind of the same way I raise my kids. I get the question all the time....are they going to play golf? My response is always the same. "If they want to." Because I don't care if my kids are good at golf or even play golf. I want them to be happy, kind kids. That's it. If Ethan wants to be a ballerina and Ella wants to be a ninja, that's cool with me. I just hope I have a happy ballerina and a kind ninja. If you come to my golf camps, classes, events, or just see me at the range, I teach some pretty simple concepts. Be kind. Use your manners. Have fun. Do the right thing. The list goes on. So as the first day, first week, and first month of school gets started, I want to address the kids in my classes, the kids who have taken them from me before, and the kids who will eventually take classes from me. What I teach during golf lessons is the same thing that will help you at school. I will welcome you with open arms when you take lessons from me. And, I'd rather have you be a great person than a great golfer. As you start this school year, I want you to remember a few things. You are awesome. You are smart. You are fun. You'll get nervous. You'll get tired. You'll do boring things in class. You'll do super fun things too. You'll meet new friends. You'll have teachers you like a lot and some you only like a little. You'll have easy work and tough work. Lots of things happen at school. Some you'll like and some you won't. But through everything that happens...Be the nice kid. When you see that kid in class that doesn't seem to have any friends...go talk with him. When you see that kid who dropped her books...go help her pick them up. When your teacher asks a question that you know...answer it. When your friends are doing something you know is wrong...walk away. I've taught golf to thousands of kids over the years and my goal is not to turn them into professional golfers. My goal is to help them become nice kids. Go to school every day and see if you can make someone else in your class smile. Make someone else laugh. Make someone else feel good. It's easy to go along with the crowd and make fun of the kids who seem a little different. Guess what?..everyone is different. Everyone has their thing. Some kids are smarter than you, some kids have cooler clothes than you, some kids are better at sports than you. It doesn't matter...you have your thing too. Be the kid who can get along. The kid that is generous. The kid that is happy for other people. The kid that does the right thing. The kid that tries his best. If you have homework, do it. If you have a test, study for it. If you have a project, finish it. Most of all, when your parents ask you to do something, listen to them. They aren't here to guide you in the wrong direction. They support you and love you. They are the ones that will help you the most along the way. Sure, there will be times when you think they are crazy and have no idea what they are talking about. Just trust them. They are here for YOU. Just like you treat your classmates at school, be nice to your parents. Have fun at school, do what you're supposed to do, and be the nice kid. I'll see you on the golf course soon. And I thought that way not because I didn't want to win or be good. No. It's because parents also taught me not to compare myself to others. Some days at school will be awesome. And others... well, not so great. Some kids will be friendly to you. And others... not so much. You always have the choice to be nice. You can't control how others act, but you can control what you choose to do. 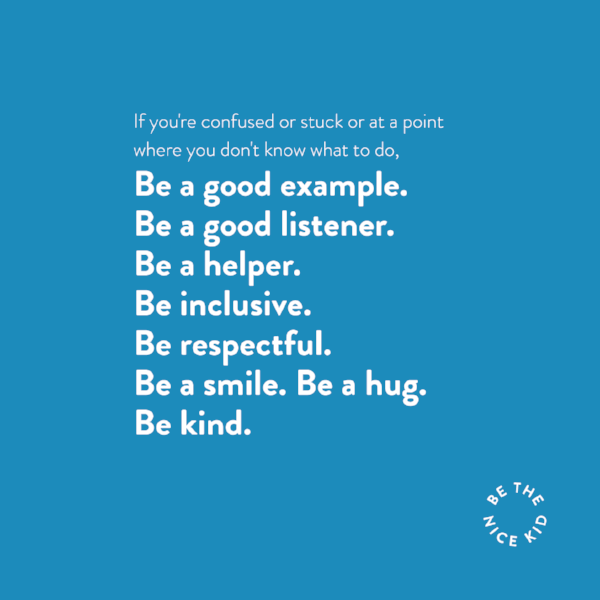 Choose to be the nice kid. When you see someone fall, help them up. When your teacher asks you for help, do it. When you see other kids doing the wrong thing, stay away. When you see someone struggling, ask what you can do. And keep an eye out for the kids who don't seem to have anyone. The kids that seem to be lonely. Just ask them to play. See, there are going to be times when you feel lonely or left out or not good enough. There are other kids who feel like that too. Sometimes a lot. Those kids might just be scared. And being scared is okay. They might just be looking for someone to reach out to them. And at some point, you'll probably feel the same way. So make a choice to be nice. I've been teaching golf for a long time now and what I've found is that the best golfers and the best kids have one thing in common. It's my job to help them feel comfortable and proud of who they are. Because every kid should have a chance to be happy. You can help me with that. Help the kids around you feel comfortable by simply being nice to them. Every kid has something that they can offer. Something that they're really good at. You want to make your teachers proud? You want to make your parents proud? So have fun at school. Help your teachers. Reach out to the quiet kids. My students and I are like a family. We support each other, we rag on each other, and we go to Buffalo Wild Wings together. Every Friday, a group of students and I go play golf at a local course. These kids have been with me for a long time now...6, 8, 10 years. I've seen them grow from curious little kids to annoying middle schoolers, back to a whole variety of different high schoolers. They all have their own quirks. Some are outgoing. Some are quiet. Some tell stories. Some are always on their phone. Some are funny. Some try to be funny. Some are confident. Some need that boost. But the best part is that it's all okay. Everybody brings something to the table. And even though they may not be best friends outside of our class, on golf day, on our day, they get along and have fun together. On this particular Friday, we were on the 4th tee box of a local executive course. I was with a couple quiet kids and a couple talkers. The quiet kids loved paintball and hockey, respectively. The talkers... they were brothers, they were funny, and they loved Arizona teas. "Before the football game last week, me and my buddy went to the store to grab something to drink. I found my favorite Asia Plum Green Tea with Ginseng and Plum Juice (Side note: I really don't remember what he said, but it was something with a lot of ingredients). You can't find that anywhere. Now get this. We got to the entrance and Admin was confiscating everything that people brought in. They were trying to cut down on drinking, I get it. But they took my tea. And it wasn't even opened. What could I put into an unopened can of tea? It sucked. It was my favorite kind. They told me I could come find them after the game and they'd give it back to me. So after the game I went and looked for someone from Admin, but couldn't find anyone. They were gone. They probably drank my tea. On Monday, I went to school and I was still mad at that whole thing. So, I went to Admin and asked for the lady who took my tea. She told me she didn't have it. And that was it. Stupid Admin. I can't believe they took my favorite tea and never gave it back." The talker lined up his shot and got ready to hit. You could tell he didn't want to let the tea thing go. He was visibly upset about the whole thing. And if I know anything about golf, tension and good golf shots don't exactly mix. Tight hands, overthinking, worrying. They all happen when you are tense. And no good comes from it. He took a swing, his tee flipped in the air, and his ball went sailing...... into the woods. He didn't say a word. He just paced around as if he was looking for something. Then we realized he was. "What are you looking for?" said his brother. Then no sound for what felt like a full minute. Until the quiet kid chimed in.